Olancho Aid welcomes groups that want to serve in Honduras! On average, 12 mission teams serve through Olancho Aid each year and groups range in size from 10-35 people. Each team leader works with Mission Team Coordinator, Oscar, to structure unique projects based on the team’s strengths and current community needs. *See VOLUNTEER-HOUSE-FEES to learn more about costs associated with bringing a team. Teams are met at the Tegucigalpa airport and travel with their guide and Olancho Aid Foundation driver, about 3 hours, to Juticalpa. Team members make themselves comfortable at the Volunteer House, which can accommodate up to 40 people in 7 rooms, each with 4-6 beds. There is a large kitchen, a living space, and a veranda. The Volunteer House has electricity, wifi, and running water. A security guard is stationed at the house from 6:00PM-6:00AM. Lunch, dinner, and purified drinking water are provided. The bilingual mission team coordinator works with each team leader to schedule projects, secure/ship materials, and plan activities well in advance of the trip. Transportation is provided to work-sites. See TEAM-LEADER-INFO for policies and more information. The Volunteer House shares its large compound with a Catholic church, convent, children’s home, and nursing home. The sisters of the children’s home live with and care for the orphans and elderly and also run a daily bakery, or “panadería,” famous for its homemade breads and other baked goods. On the second-floor balcony of the Volunteer House, the Honduran horizon is in plain view. This wide veranda is where countless mission teams have shared meals, bonded in faith, and made memories. In the early mornings the bakery’s aromas make for a warm welcome to the day, and at night, the blanket of stars above embrace the teams as they wind down and share experiences of the day. The Volunteer House is a special place for groups to live in the community and grow individually and together. Olancho Aid has had the blessing to host several church groups, businesses, and schools from the following states: New Hampshire, Massachusetts, Texas, Tennessee, Louisiana, South Carolina, and California. Interested in bringing a team to the hills of Olancho? Contact Oscar Fuentes for availability. 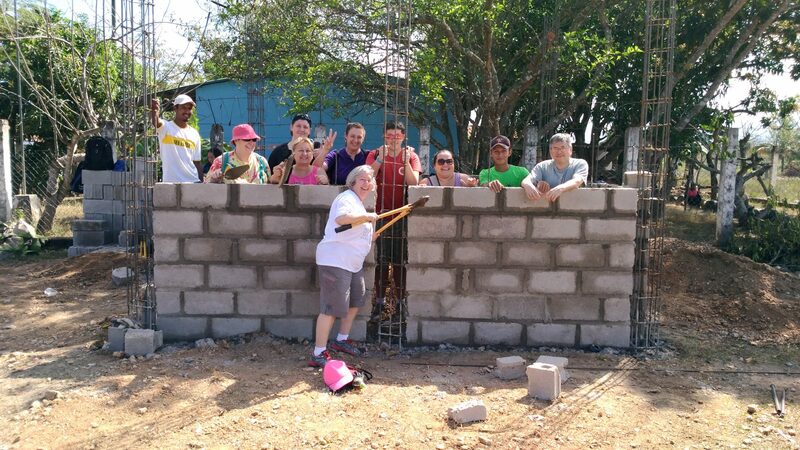 Eleven team members made the journey to Olancho this year in March. Their efforts ranged from food distribution to a clinic for the cloistered nuns to data collection on El Chaparo’s use of their solar powered water filtration system. The group also painted in various locations and taught an art class at CEBSC. They really did and saw so much this year! Mary Roy’s life changed in 1993, the first time she spent 10 days serving in Olancho. She has worked to organize a team every year since. In 2016, 29 others joined Mary, they included students, medical professionals, church members, and others connected to their network. The group washed heads at Laguna Seca, distributed food, judged a school science fair, and painted at various locations that were in need of some fresh color! Now an important piece of their tradition, the group went to mass in Jutiquile and shared coffee with Maria, who so generously welcomes them year after year. The team of 15 from Rockland truly made themselves part of the community by sharing in experiences with locals ranging from music and dance to ice cream and crayons! They began their work with painting projects in several locations including the water purification system in Casa Viejas. They brought ice cream to children in El Chaparro and food to the community of Lobo Sosa. Partnering with local bomberos, the team distributed water in the poorest neighborhoods surrounding Juticalpa. The smallest children in a one-room schoolhouse soaked up the moments they spent coloring with the North American volunteers and Iguanas Water Park may never have seen so many smiles as the day Holy Family Rockland Team spent the day splashing with Nazareth students! In 2016, St. John the Baptist parish from Westport had 13 team members (15 if you count Rick & Don, they don’t need last names because everyone in Juticalpa knows Rick & Don). Leading up to their trip, they wondered how many patients they could possibly treat after learning that a few of the medical professionals who normally join them would not be able to make the journey this year. Rather than scaling down their efforts, the team managed to streamline their process for intake, assessment, and treatment of patients. Big energy and motivation made up for fewer hands, more patients were served in 2016 than any year before! And the members who are not medical professionals? Some taught village children how to properly brush their teeth, others passed out clothing & shoes. Oh, and this team’s age range is 12-80+! 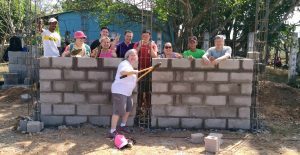 St. John’s Parish from Prairieville, LA, sent two teams to serve in Olancho during 2016. Team #1 had 30 members and Team #2 was comprised of 15. The teams participated in various painting, construction, and community outreach initiatives. The team painted churches and schools, laid a foundation for a new schoolhouse, distributed more than 60 suitcases full of supplies to rural communities along with providing a teaching in-service for Olancho Aid Schools. St. John’s team has been instrumental in providing educational materials along with technology solutions for Olancho Aid since 2011. Early in June 2016, Holy Family Team #1, took on several projects during their time in Olancho. College students make up the majority of the group of 35 team members. 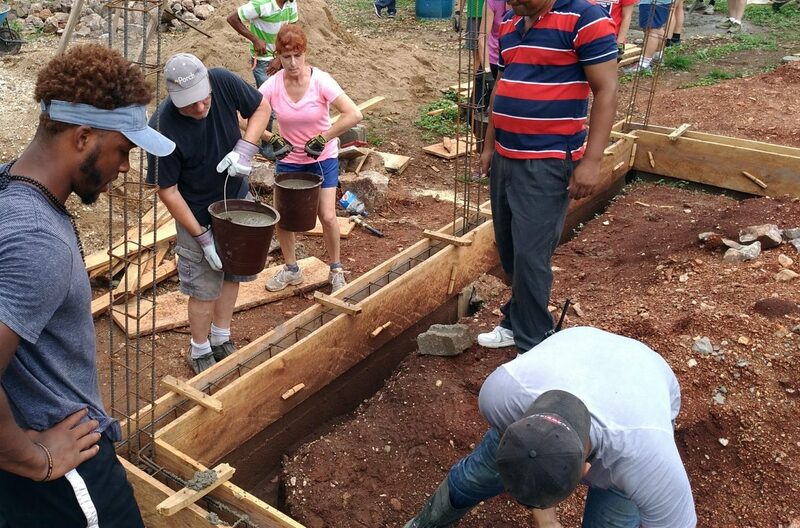 They all got a workout as they painted a school house, dug footers in El Higuerito, mixed concrete, restored a church, played in a village soccer game, and participated in bucket brigades … more than once. In the less physically strenuous moments, they had time to visit students and attend mass at Jutiquile. Some of the most powerful moments and memories hit team members while they spent time in prayer, shared meals, and laughed together at Volunteer House. Holy Family Team #2 hit the dusty road in June 2016 to visit villages, dig trenches, and share in community with each other. The group of teens and young adults numbered 17. They laid the groundwork for water purification systems in two villages, El Encinal and La Concepcion. These systems will provide water to hundreds of families. Although this was not the first Olancho Aid experience for all team members, it is safe to say that all eyes were opened a little wider to the realities of poverty in Honduras. Perhaps the team was moved most when village members, who had so little, found a way to prepare a meal and share their hearts with new friends from Tennessee. Want to hear from and about our teams? Check out the Volunteer House Blog. Read more about our mission teams’ results. What kind of people participate with mission teams and what do they do? We have had students as young as 12 and retired adults over 85 participate with mission teams. The projects are as varied as the amazing people who join us in service. Mission teams are responsible for flights to and from Tegucigalpa (Toncontin, International Airport). Olancho Aid provides transportation to and from the airport. One of our drivers, along with a bilingual staff member and a big yellow bus will be at the airport to greet you when you arrive in Tegucigalpa. They will also return you to the airport in Tegucigalpa on your departure date. The airport is located about 3 hours from Juticalpa, Honduras. OAF also provides transportation to and from your work projects each day. Housing is provided, at the listed fee, in the Volunteer House that can sleep up to 40 people. The house has running water, bathrooms, showers, a kitchen, gathering areas, and a chapel. A security guard is stationed at the volunteer house at night and a bilingual Olancho Aid employee will be with your Mission Team during the day. We also provide two-way radios and cell phones so Mission Teams can be in constant contact with our main office, and so they can contact family in the U.S. As necessary, security guards accompany groups to and from the airport as well as work sites depending on various circumstances. We have a cook at the volunteer house that will prepare lunch and dinner for groups each day. A continental breakfast is provided each morning as well. Most groups choose to bring additional snacks (crackers, oatmeal, peanut butter, etc) in case a Team Member does not care for the meal that is provided. Are we on our own after we arrive at the Volunteer House? A bilingual OAF employee will be assigned to your group each day, they will coordinate your work, travel with you to your work projects, and help supervise your team. How do we figure out where to go and what to do? Once you determine the type of work you want to do (see below) we will coordinate planning with the appropriate village, school, family, or church you will serve. Each Mission Team Member that travels to Olancho Aid must sign the “Release Form” either electronically on the website or by printing, signing, and sending to our PO Box in the U.S. prior to traveling to Honduras. Are there Volunteer House rules? Olancho Aid will provide each Mission Team with a manual that includes details about the volunteer house, rules, and suggestions on staying safe while in Juticalpa, Honduras. Is there an emergency plan, just in case? We have an evacuation plan in place in the case of an emergency. This plan will be posted in the Volunteer House and a copy can be shared via email upon request. The evacuation plan includes details in regards to a central meeting place, transportation to an international airport, as well as security measures that we have in place should something happen while your team is visiting. What is the cost for my team? Volunteer House rental fees, see Volunteer-House-Fees. Cost of Projects: these costs will depend on the type of project you choose or the amount of money you are able to raise. Generally, teams contribute $2,000-$10,000 towards projects. What kinds of projects can my team do and for how much? $10,000 + per team – various construction projects can be completed with this level of contribution. We have a list of current needs and can share it with you if you have interest in a larger scale project. Oftentimes these projects benefit students at one of the Foundation’s schools. Groups in the past have built classrooms, workshops, a cafeteria, and have contributed to many other projects at OAF. 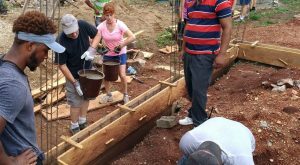 At this level, we can also hire Honduran construction workers to assist your Mission Team in completing a project. Medical Supplies and Pharmaceutical Drugs – We have some medical groups who bring supplies and medicines. They host medical and dental clinics in remote villages. These mission teams consist mostly of healthcare professionals. Clothing Donations – We encourage all groups to bring used and/or new clothing & shoes to donate. We can spend a day or two and distribute these items in communities that lack these basic necessities. This a great experience for your team, one they won’t forget. Teams are responsible for the cost and booking of their flights. There are direct flights daily from Miami (American Airlines), Atlanta (Delta Airlines), and Houston (United Airlines). Flight times and dates should be coordinated with Olancho Aid prior to booking. Do we need any vaccinations? How much can I expect to spend once I arrive? This is up to each individual team member. The cost of souvenirs and miscellaneous items here in Juticalpa are typically very inexpensive. $50 would be efficient for covering the cost of a few small souvenirs and a few snacks while visiting the shops in Juticalpa. If your team wants to plan a group dinner at a local restaurant or an excursion (fun day) in order to experience the culture here in Juticalpa we can discuss that cost with team leaders. Each team member will need a valid passport when traveling to Honduras. Be certain your passport DOES NOT EXPIRE within 6 months of your return date. Example – If your return flight home to the U.S. (from Honduras) is on May 15, your passport must be valid through November 15.